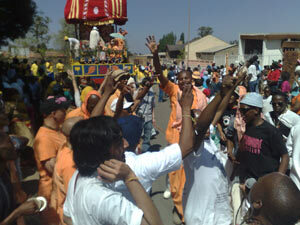 Soweto, suburb of Johannesburg, South Africa, a home to 1 1 million African people, the main stage in the fight for freedom during pre-’94 ‘Apartheid’ for freedom, home of social injustice, home of a small Hare Krsna temple celebrated its second Ratha Yatra on Saturday, 26 Sept. 2009. 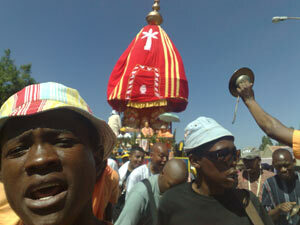 Soweto, where every step is a dance and every word is a song is made for kirtana. Lord Caitanya’s sankirtana movement is here to stay. As the procession rolled down the street, people where eager to catch some of the endless fruits that were raining down from the chariot. In their eagerness to get prasadam, left and right kids were diving on the ground. There were jambees, foufouzellas (a local plastic horn), wistles, besides the mrdangas, karatalas and so on. 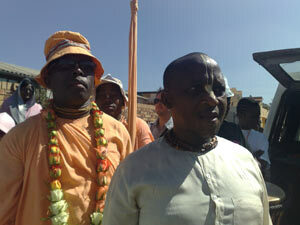 Mahaprabhu dasa is the local Temple President, the man who made it happen accompanied by HH Bhakti Nrismha Swami, the first sannyasi of South African origin, who preaches all over the African continent. 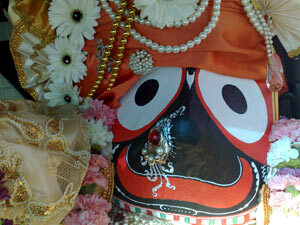 Mahaprabhu joined ISKCON in the mid- eighties and stayed in several temples. 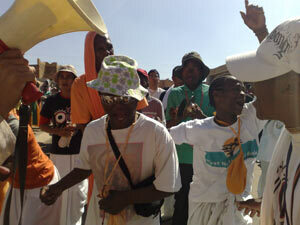 He stepped out of comfort zone, when he volunteered to return to Soweto to preach. At first he was practically all alone with his wife Malini. 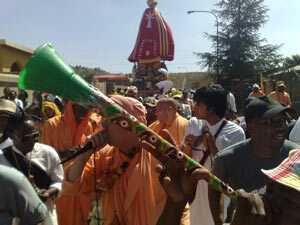 When he leads kirtan, he goes in a trance, the beat is strong but not passionate, and people…. go mad! In the beginning he attracted some boys on hari nama and some of them dressed up like devotees for the occasion, and in this way they became devotees. Now ISKCON Soweto has small temple with a regular congregation, weekly Sunday feast and lots of prasadam distribution and hari nama, as a result hundred of school-kids are among the regulars. ISKCON South Africa is very developed with two huge temples in Durban and many thousands of devotees mostly from an Indian background. Durban annually holds one of the largest Ratha Yatras in the world outside of India, a 4 day festival, where a quarter of a million people participate in a huge cultural festival and 200,000 plates of prasadama are distributed. Every year the Deputy Mayor of Durban graces the festival and tells the story, how during the ‘Apartheid’-days he was a member of the ANC, the revolutionary anti-government party. He was jailed in to solitary confinement and they allowed him, one book only to read, he said, Bhagavad Gita. For two years he was alone in a cell with only Srila Prabhupada’s Bhagavad Gita- As it is. 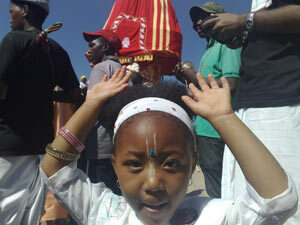 Today seeing the response in Soweto to the appearance of Lord Jagannatha’s Ratha Yatra, it strikes me that the time is not far away, that there will be more devotees of African- then of Indian origin, along with those of European roots in the South African Yatra. Lord Caitanya can unite the people of the world and overcome all cultural barriers, in chanting and dancing for the Lord. Jaya Jagannatha, Jaya Jagannatha, Jaya Baladeva, Jaya Subhadra!